John Scott, writing for the Los Angeles Times in 1936, took his readers back 10 years to 1926. How could so many popular film players have simply vanished into thin air. How could their stars have eclipsed so quickly? “You’ll live longer and have a steadier job if you stay out of the movies,” he wrote. “The life of a film player is approximately five years on the average.” Seventy-five percent of the stars, children, and character actors were no longer active. Where had they gone? Valentino was dead, as was Barbara La Marr, Gladys Brockwell, Belle Bennett, and Alma Rubens. Jobyna Ralston was now a devoted wife to Richard Arlen. Bebe Daniels was Mrs. Ben Lyon. What had happened to Anna Q. Nilsson, Viola Dana, Shirley Mason, Lloyd Hughes, and Sydney Chaplin? Marion McDonald possesses her man. 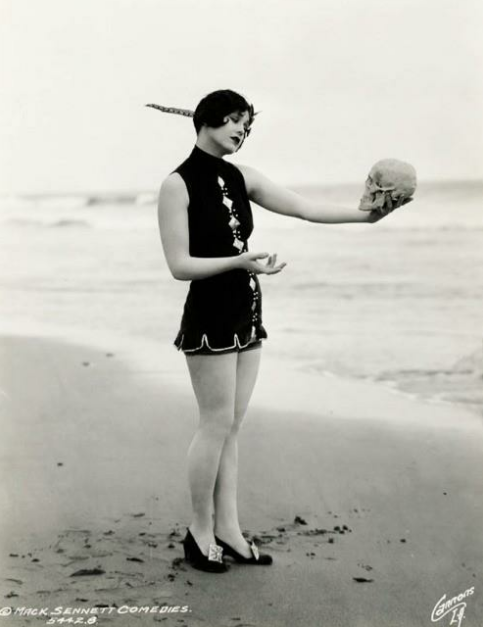 Marion McDonald was the screen vamp, a siren who not only toyed with her men, but sometimes held their skulls in her hand. 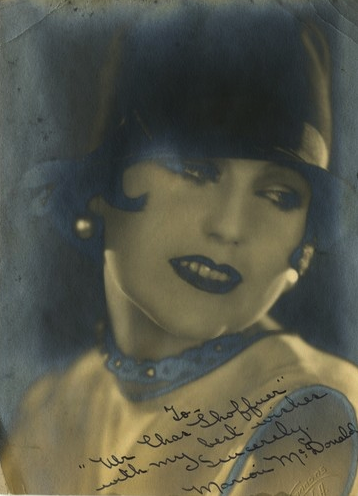 Her star rose for a period in the mid-1920s, but fell into a dark horizon around 1927. A Mack Sennett Bathing Beauty, a screen glamour girl, a lovely, young woman whose future in films seemed set. Vanished? Before I even knew who Marion McDonald was, I knew the face. I came across a photo of her and Eddie Quillan in an old movie magazine I bought in a antique mall a number of years ago. She is vamp personified. I set out to answer the question: Who was Marion McDonald and whatever became of her? My research took me back as far as 110 years to Missouri, Massachusetts, California, and Florida. Here’s what I discovered. 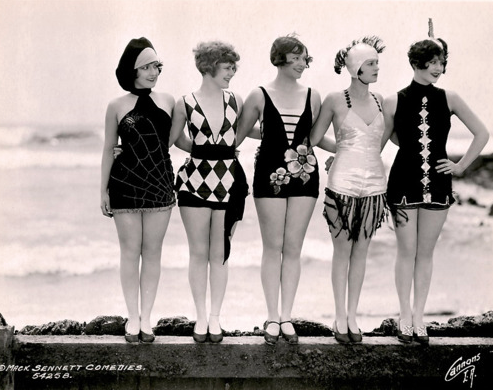 Marion McDonald (R) with other Sennett Bathing Beauties. The screen vamp was born Marion Elizabeth McDonald on May 14, 1904, to Robert E. and Lucy Berger McDonald in St. Louis, Missouri. Her father’s parents were Scottish and Irish. Her mother’s parents were from Holland and Pennsylvania. Marion was one of seven children. 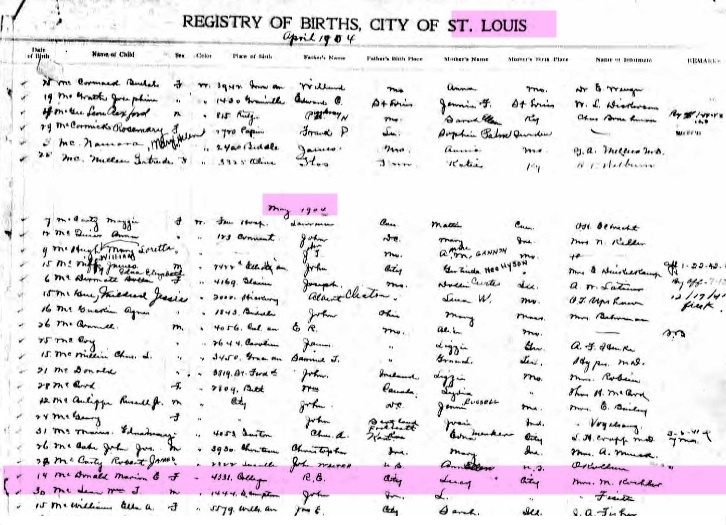 Marion McDonald in the Missouri birth records. By 1920, the McDonalds were living in Winchester, Massachusetts, where Marion’s father had a successful shoe and boot business. 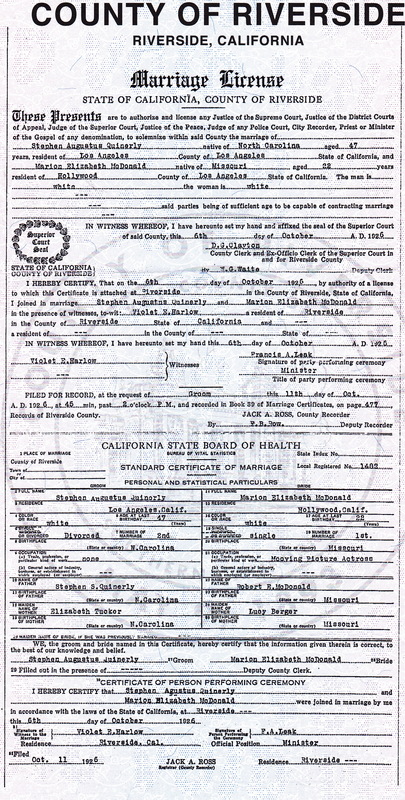 In the early 1920s, the family moved west and settled in the Los Angeles area. The scene was set for Marion to break into films. Several references list The Turning Point (1920) and Cameron of the Royal Mounted (1921) as her first films. I suspect, however, that it was the “other” Marion McDonald, the wife of actor William Colvin, who appeared in those films. Marion’s entry into films came through Mack Sennett as one of his bathing beauties. Her first recorded film was East of the Water Plug, a Ralph Graves and Alice Day two-reeler. What little publicity she had came in 1925, when Hollywood thought her to be a major comedic find. While she found steady work with Sennett is his two-reel comedies, her roles were supporting or worse. She played girlfriends, office workers, bridesmaids, sisters, maids, and part of the scenery. She excelled at playing vamps and flappers. Marion’s name typically fell to the bottom of the cast. The feminine leads went to Alice Day, Madeline Hurlock, and Ruth Hiatt. Marion had little to do but sit around and look seductive. After appearing in a small role in The Prince of Head Waiters, Marion gave up vamping for the camera and married Stephen A. Quinerly, a businessman who owned theaters in Miami, Florida. 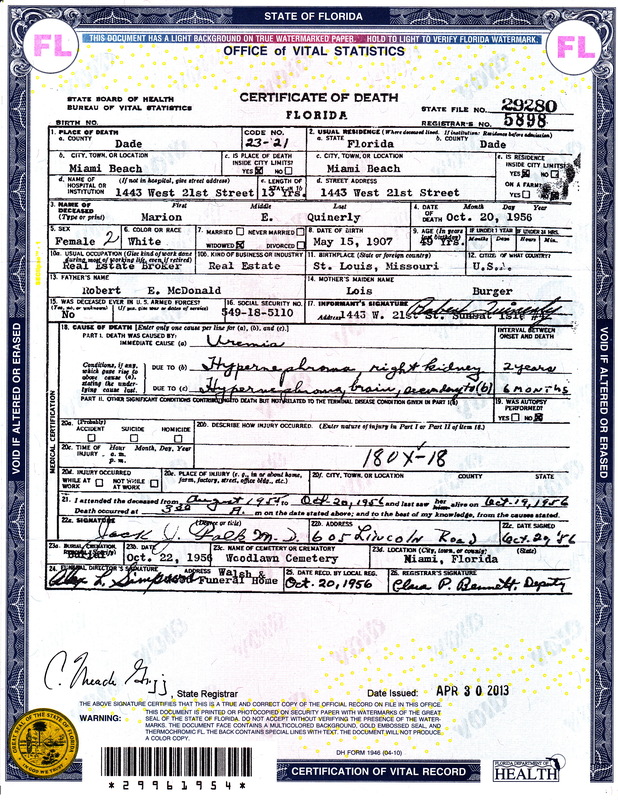 Marion was 22; the groom was 47. 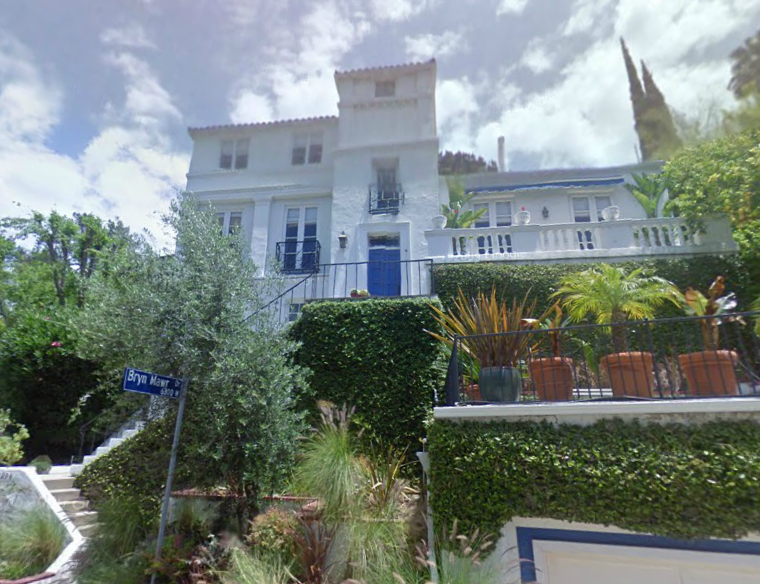 The Quinerlys had homes in Miami and Los Angeles, high in the Hollywood hills. The Quinerly’s Hollywood hills mansion, 2294 Alcyona Drive. In 1928, a daughter, Sally, was born. 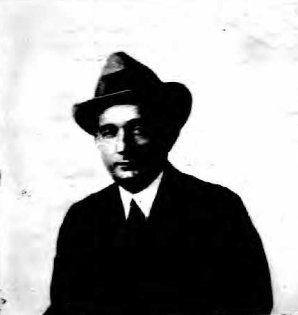 Stephen Robert (Bobby) followed in 1929. While Marion became a real estate agent in Miami, at least two of her siblings continued to work in the studios. Sister Peggy was Jean Harlow’s favorite hairdresser and worked for her at MGM. Brother Charles McDonald worked as a studio grip and electrician. 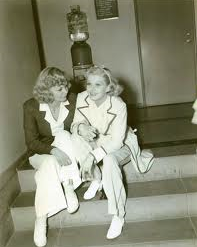 Peggy McDonald, Marion’s sister, and Jean Harlow. 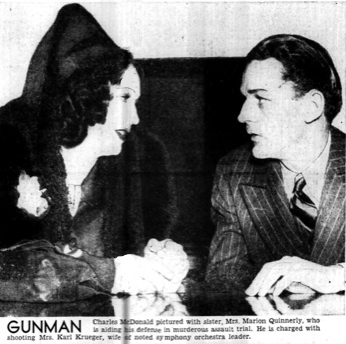 In August 1938, Charles McDonald shot and seriously wounded Emita Krueger, wife of the noted symphony conductor, Karl Krueger, as she exited her car on Hollywood Boulevard. She was picking up her daughter from a dance studio. 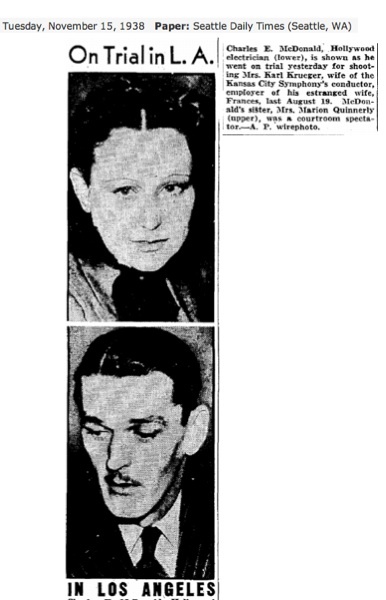 Newspapers printed the lurid details of McDonald’s jealousy of Mrs. Krueger’s attentions to his wife. He finally snapped. While Emita Krueger hovered between life and death, McDonald sat behind bars. Marion rushed to California to support her family. While newspapers ran photos of her, none mentioned that she was once a Sennett Bathing Beauty and actress. 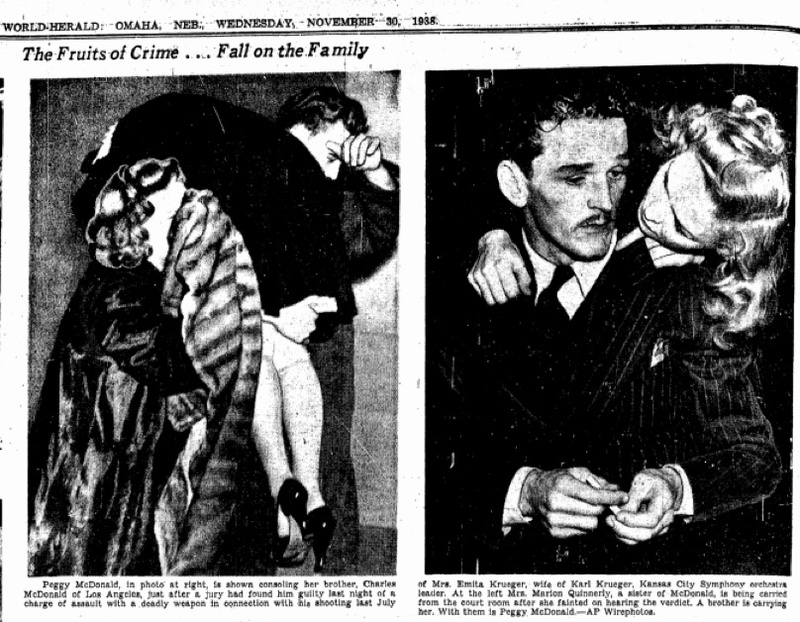 When McDonald was found guilty of attempted murder, Marion fainted and had to be carried from the courtroom. Charles McDonald was sentenced to San Quentin to serve from one to ten years. The shooting left Emita Krueger paralyzed from the waist down. She was sentenced to spend the rest of her life in a wheelchair. She died at age 59 in March 1953. Marion spent more time in Miami, where she worked as a real estate broker for Alan White Associates. The Quinerlys lived and entertained in their home on Miami’s exclusive Sunset Island. While she knew how to put together a lavish party for her friends, her granddaughter says that perhaps Marion lacked the skills needed to be a nurturing mother. Stephen Quinerly died in 1945 at age 66. Marion remained active until 1954, when she developed hypernephroma (a type of cancer) in her right kidney. The cancer eventually spread to her brain. She died on October 20, 1956. She was only 52. Thanks to Marion’s son-in-law and grandchildren for their help in documenting Marion’s life.